Don't smell crotches, don't eat plants. Don't steal food or underpants. DON'T RIP THE STUFFING FROM THAT CHAIR! Don't chew my shoes, what IS this mush?!? Outta the toilet! Outta the sink! AWAY FROM THE LITTER BOX, IT'S FOR THE CAT! Those rugrats are funny but also quite crazy. 'Cause after three years you'll get back your life! And maybe I'll get back my good diamond ring! 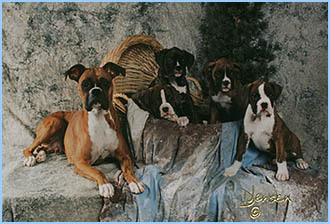 InterNat'l CH Bix-L's Mia Bella Rosa and puppies. 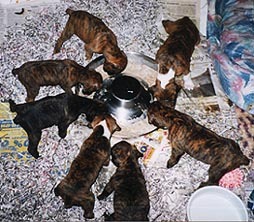 Rosie's litter was born between noon and 6 pm of September 1, 1999. 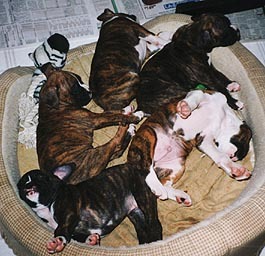 We have 5 boys, 2 girls, all brindles. 2 of the boys are flashy, the others have minimal white. 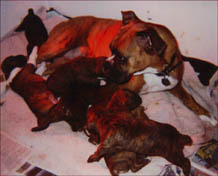 Most of the puppies weighed 16 ounces, with one big boy at 20 ounces and 2 smaller pups. Rosie had an easy whelp, and is trying to figure out this motherhood business. 7 puppies are a challenge to feed, so we have a warming pad in the box, keeping the pups nursing in 2 shifts (less fighting for the desirable teats that way.) Rosie is totally fixated on the pups for now, only eating and drinking if I bring it to her. Hopefully, the novelty will wear off soon and she will be easier to get to eat! For now, we are both sleep deprived as we make sure no puppies get squished, and everybody gets a full tummy. Newborns, all in a row. The puppies at 1 week old, and the 2 flashy boys. The puppies at 3 weeks. Rosie is much less obsessive of them, and prefers to sleep most of the night in our bedroom away from them. They are learning to bark, growl and show dominance to their litter mates. Personalities are definately showing! 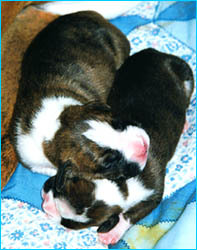 On the right is the small female. Here 5 of them are at 5 1/2 weeks. please click here to go to page 2. Thinking of getting a Christmas puppy? Before you go and buy that puppy, please read this! A great Essay on pet ownership and responsibility. Want to be an informed puppy buyer? Here is a very comprehensive site about puppy selection, Do's and Don'ts, choosing a vet, choosing a responsible breeder, etc. A must read for any potential new puppy owner! Here is a site on Puppy Mills Did you know almost all Pet Shop puppies come from these places? Go to see what happens at a puppy mill, and you will never patronize a pet shop that sells puppies again. 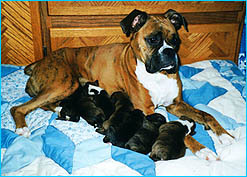 What the AKC says about boxers, temperaments, health and more. Want to know what the ideal boxer is? Check out this site: American Boxer Club official page.